Ricinus communis L., an annual or perennial herb of the Euphorbiaceae family and cultivated mainly in tropical and subtropical regions worldwide, possesses antimicrobial , acaricidal , and antidiabetic activities . According to the Chinese Pharmacopoeia, the seeds of R. communis are applied to cure scrofula, chronic pharyngitis, skin infections, etc. . 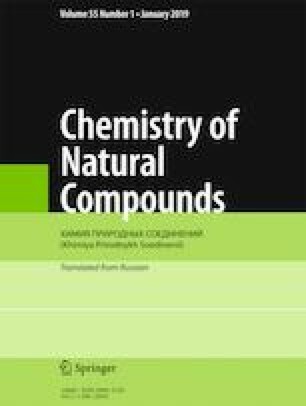 In our continuous efforts to find antidiabetic therapeutics from medicinal plants, the chemical constituents of R. communis were investigated, which led to the isolation of 23 compounds. The spectral data of compound 1 are reported for the first time in this paper, and the inhibitory activities against protein tyrosine phosphatase 1B of 1 and its analogues were evaluated. Published in Khimiya Prirodnykh Soedinenii, No. 2, March–April, 2019, pp. 330–331. This project was supported by the National Natural Science Foundation of China (No. 81360477), the Fund of Guangxi Key Laboratory of Functional Phytochemicals Research and Utilization (No. FPRU2014-6), and the Natural Science Foundation of Guangxi (No. 2016GXNSFAA380268). The PTP1B inhibitory assay was carried out by the National Center for Drug Screening, Shanghai.